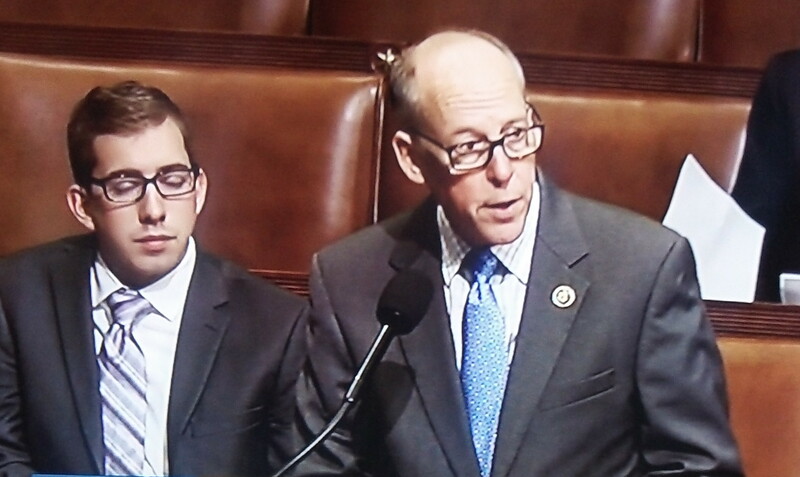 Rep. Greg Walden in a TV shot from November. This week he talked about Harney County. Most of the cartoonists and editorial writers holding forth about events in Harney County don’t know the first thing about the place. They should spend a few minutes and listen to Congressman Greg Walden, whose 2nd District includes all of Eastern Oregon. The congressman does not condone the “occupation” of federal property at the Malheur National Wildlife Refuge by protesters. But he talks about the reasons for that kind of extreme reaction. The reason is the history of behavior of government agencies that misinterpret federal laws, ignore what residents and property owners say and refuse to take their interests into account. What’s supposed to be the defense against repeated abuses by public officials over which local electors have no control? If hundreds of people attend public meetings, testify at hearings, sign and submit petitions and none of it gets any traction, ever, are they supposed to just give up? Greg Walden, et al, can pontificate all they wish. The ownership of the land has been settled — until/if/when congress or the courts decide otherwise. It is up to same for enforcing the laws – not the general populace. Exactly my point… It is then up to the courts & law enforcement to do so – NOT – armed insurrection. Oh, wait a minute, the courts have already decided multiple times these folks are on the wrong side of the law — as have the Hammonds, the local townspeople, the local law enforcement, etc. I don’t like many of the laws I have to adhere to. That gives me ZERO right to occupy (armed to the teeth) any local/state/federal building because of that. What reasons have they to be angry? Ranchers receive massive federal subsidies to graze their cattle on federal land, which is by law supposed to be managed as a wildlife reserve. The Federal Government conveyed Sections 16 and 36 in everyTownship of 36 square miles to the state in the Admissions Act when Oregon entered the union. That title was settled. BUT here in 2016 all of that land that was to support schools has still not been released to Oregon. It is an indication of the unwilling nature of the government to do what they promised legally to do. Those Sections of a square mile each if in remote areas were to be traded for similar “In Lieu of” lands, and reaffirmed in a court case in the 90s. Still not fulfilled. Ranchers are encountering the same problems on a different level. Other Ranchers have not survived the heavy handed government but the Hammonds have been able to hang on. If your drivers license was revoked, if your water was shutoff, if your license for your business was cancelled….what would you do? The facts are very complex. First, That sections numbered sixteen and thirty-six in every township of public lands in said State, and where either of said sections, or any part thereof, has been sold or otherwise been disposed of, other lands equivalent thereto, and as contiguous as may be, shall be granted to said State for the use of schools. Second, That seventy-two sections of land shall be set apart and reserved for the use and support of a State university, to be selected by the governor of said State, subject to the approval of the Commissioner of the General Land-Office, and to be appropriated and applied in such manner as the legislature of said State may prescribe for the purpose aforesaid, but for no other purpose. “The act of Congress admitting Oregon ​to the Union in 1859 granted sections 16 and 36 in every township “for the use of schools.” The provision of land for educational purposes was a practical solution for the developing nation that was “land rich, but cash poor. In Oregon, Congress granted roughly six percent of the new state´s land-nearly 3.4 million acres-for the support of schools. Due to various circumstances, about 700,000 acres remain in state ownership today. The State college funded under the Land Grant system is today called Oregon State University. That was a wonderful speech. It was the first time I’ve listened to Rep. Walden, and the entire 24 minutes was worthwhile. This was not pontification, it was an explanation what is happening. The disconnect between congress which makes the laws and the agencies which enforce or do not enforce the laws. It was an appeal to not push the grandma rancher into bankruptcy these next five years by not continuing her grazing lease. It was an appeal to justice, in the sense that the punishment should fit the crime, did not happen in this case. It was an appeal that the intent of laws matters, terrorism laws should not be applied to lesser crimes. It was a bit of an explanation of what happens when both the government and companies and private citizens have to fight wildfires, and the mis-steps that can happen in such a dynamic enterprise. There was nothing in his speech about ownership of the land, but there was talk about working jointly to manage lands in the west. Interesting monologue. Like at 7:59 where this Congressman states that the bureaucrats “… wanted to put the noose around the neck of those who were inside [in-holders]…” Now isn’t that just so colorful: a US Congressman accusing “bureaucrats” using the language of a lynching. When I hear him saying something like that I feel pretty sure that what I’m hearing is probably somewhat one-sided. And such are his other accounts of “the arrogance” of the bureaucrats. Were they really? We were not there to hear what “the bureaucrats” may actually have said. Then there’s this gem at 10:39 where he cites the Oregonian for ridiculing the people on the ground, oblivious to the fact that he spent the prior 10 minutes ridiculing bureaucrats. At 11:09 he accuses “…this administrations is secretly, but not so much,…” (so it’s not a secret?) “.. is threatening in the next county over..” (Threatening?) “…to force a monument of 2 and a half million acres, we believe.” Gee, a not-secret, secret proposal to create a national monument, maybe, he believes. More inflammatory rhetoric, even while he berates the president for apparently considering a proposal. As he goes on and on. We hear the regular litany about about public officials not listening to the people and just deciding on their own. You know, just like Gordon Shadle and his attacks on CARA, where the reality is that the officials almost certainly also heard views from other people that think differently than the views Mr. Walden apparently supports. When Walden talks about listening to “the local people”, we need to remember that just last month he killed the Klamath Basin Water Rights Agreement that had been hammered out over years of bickering and had the support of the stakeholders and the rest of the Oregon delegation. So much for listening there, Greg. The rhetoric Walden chooses is pretty much the same as used by the Bundy’s, without the insurrection and threats of force. There is no single view of why there is governmental distrust. For every conservative yelling about governmental overreach there’s a liberal complaining that government is not being strong enough in protecting things. Greg Walden is posturing in this video to retain the votes of his constituents. Let’s hope that behind closed doors he’s actually trying to help the Harney County Sheriff get this all settled peaceably. This is the same Sheriff who talked today on OPB about how those “bureaucrats” were family people living in the community, sending their kids to school, and that all the folks know each pretty darn well and get along. Ok lets add this to the story: The Oregonian is reporting that the Hammonds were arrested in the 1990’s for making death threats against federal employees and interfering with a fencing operation. I trust more information will be available tomorrow. Thank you, Hasso, for letting us hear the moving speech by Rep Greg Walden, who may well be the last one from Oregon to defend us from our irresponsible unelected bureaucrats. Thank you, Mr. Walden.